The AudioCodes C450HD IP Phone is a feature-rich, executive high-end business phone for the Microsoft Teams and Skype for Business market. It supports single click switch over between Microsoft Teams with native client experience and Skype for Business. The C450HD is equipped with a large 5" colour touch screen, integrated Bluetooth and optional integrated Wi-Fi. AudioCodes IP phones can be offered as part of the Managed IP Phones solution which defines the IP phone as an IT-managed entity and delivers unique and complete lifecycle management of end-user desktop devices. AudioCodes provides diverse solutions tailored for the unified communications (UC) market. AudioCodes’ offering for UC includes media gateways, E-SBCs, call recording solutions, mobility and IP phones which, in addition to high-quality voice calls, also support presence features. AudioCodes IP phones offer reliable, high-quality communications for users of on-premises, open source and hosted IP-PBXs. Their wide range of essential business features, reliability and proven interoperability makes them the perfect choice for any SIP-based environment, from SOHO up to large enterprises. 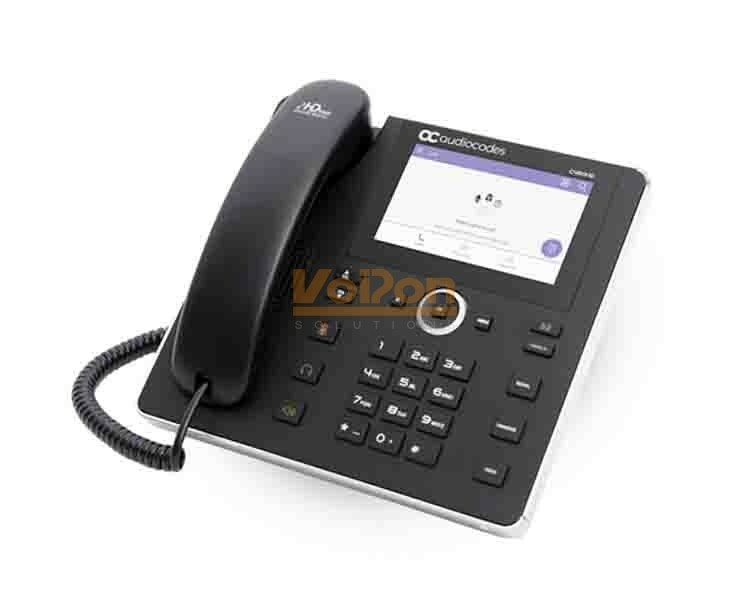 VoIPon - your AudioCodes C450HD IP Phone 800x480 5'’ Color Touch LCD and Power over Ethernet (PoE) Teams compatible[TEAMS-C450HD] distributor, supplier, reseller! Get all your wifi at VoIPon! If you would like to be notified when the"AudioCodes C450HD IP Phone 800x480 5'’ Color Touch LCD and Power over Ethernet (PoE) Teams compatible" is re-stocked, please enter your contact details and we will notify you instantly.